Saddam Hussein was hospitalized Sunday, says the chief prosecutor, and is being fed with a tube to make sure he will be well enough to continue with his trial. The procedure was ordered on the 17th day of Saddam Hussein's hunger strike, as the ex-leader's troubled trial nears a verdict that could lead to his hanging. Prosecutor Jaafar al-Moussawi said he learned that Saddam's health had become "unstable because of the hunger strike" during a visit to the U.S.-run prison where the former ruler and his seven fellow defendants are held. Al-Moussawi said the feeding tube has stabilized Saddam's health and the former president is expected to appear in court as scheduled this week. Saddam is not scheduled to appear Monday, when the trial resumes after a two-week break, because that is the day that other defendants are to give their final summations. Saddam and seven co-defendants have been on trial since Oct. 19 in the deaths of Shiite Muslims after a crackdown in the town of Dujail, which was launched after an assassination attempt there in 1982. They could receive the death penalty — by hanging — if convicted. Saddam's lawyer Khalil al-Dulaimi said none of the defendants nor their lawyers would appear Monday unless the court "meets the minimum requirement ensuring a fair trial for the defendants." Al-Dulaimi told The Associated Press that Saddam was "in high spirits and his health very good" despite the hunger strike. Officials say Saddam and three other detainees have been refusing food since the evening meal of July 7 but have been drinking coffee and sweet tea. Authorities also say the 69-year-old former Iraqi president has been advised by "medical professionals" of the dangers of not eating. "He's continuing to refuse meals," said Lt. Col. Keir-Kevin Curry, a spokesman for the U.S. detention command. "He remains in coalition care and custody, and we're providing appropriate medical care." U.S. officials have not identified the others who are refusing food, but defense lawyers say they are co-defendants Barzan Ibrahim, Saddam's half brother; former Vice President Taha Yassin Ramadan and Awad al-Bandar. The hunger strike was launched to demand better security for the defense team. Three of them have been assassinated since the trial began, most recently Khamis al-Obeidi who was abducted and slain June 21. The defense team blamed the killing on Shiite militiamen and announced it would boycott the trial in protest over the lack of security. In a letter to the court, the defense said it wants U.S. authorities to provide security for the lawyers and their families. It also demanded a 45-day recess to allow it to prepare closing statements and that court promise to allow them as much time as they wanted to present final arguments. Chief Judge Raouf Abdel-Rahman suspended the proceedings July 11 and warned that if the defense does not appear Monday, he will appoint other attorneys to make the final summations. Al-Bandar and Ramadan were to make final arguments Monday, followed by Saddam and Barzan. The four other lawyers have already presented their summations. Following summations, the trial will be suspended while the five-judge panel deliberates a verdict. The verdict is expected by mid-August. Saddam is also due to stand trial Aug. 21 for a crackdown against the Kurds in the 1980s during which an estimated 100,000 Kurds were killed. Security had been a contentious issue even before the current trial began. Some human rights organizations had questioned whether a fair trial could be held in a country wracked by bombings, killings and armed insurgency — some of it fanned by the former president's supporters. U.S. and Iraqi officials brushed off such criticism and insisted that Saddam should face justice before his own people for the suffering caused by his totalitarian regime. Court spokesman Raid Juhi said the defense had rejected an offer of the same security provided to the judges and prosecution lawyers: residence inside the Green Zone, the fortified Baghdad neighborhood where the court is located. 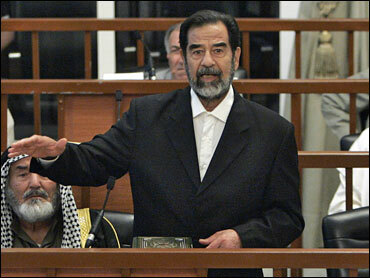 But the trial has been dogged by other problems, including boisterous behavior by Saddam and his half brother. The first chief judge, Rizgar Mohammed Amin, stepped down in January after complaints of political interference and criticism that he failed to control the proceedings. Abdel-Rahman has been strict with the defendants and lawyers, throwing some of them out of court on occasion and ordering to silence Barzan for speaking without permission.